Thick padded seat and back with built-in lumbar support. Waterfall seat reduces stress to your legs. Available in Blue, Burgundy, Grey, and Black (as shown). Back height and depth are fully adjustable. Pneumatic seat height adjustment. 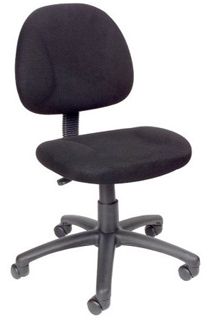 5 star nylon base allows smooth movement and stability. Hooded double wheel casters. Overall Size: 25″ W x 25″ D x 35″-40″ H.